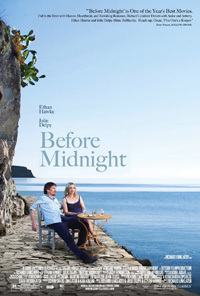 Indie director Richard Linklater started the journey of this trilogy with Ethan Hawke and Julie Delpy in Before Sunrise two decades ago (1995) while in their 20s, followed by Before Sunset (2004) in their 30s. In the first encounter idealistic Jesse and Celine met on a train in Europe spending the night getting to know one another in Vienna. Another decade later they reconnect in Paris where their inevitable relationship ignites. Here, now entering their 40s, they are spending the summer in Greece with their two girls, with Jesse's son (from his previous partner) heading back home from visiting them. In the naturalistic talky tradition established back with the first film, it continues here, kicking off with an extensive single shot driving scene of almost 10 minutes, Jesse and Celine's discussion moving from his connection with his son to how their relationship could be in jeopardy (partially spurred on by him wanting her to turn down a good job offer and move to Chicago from France, plus conflicts about his son and ex-wife). After lunch with friends they head off for a stay in a hotel (for some much needed alone-time), but here the issues escalate. She's a strong willed French woman and activist, and he's a carefree American writer – the natural conflicts in their relationship bubbling to the surface. A lot of their doubts, fears and assumptions come to the fore, including suspicions of infidelity. Linklater's philosophical, emotional and analytical cinematic approach is always very engrossing, good performances definitely pulling you into these expansive chats, conversations, dialogue and storytelling about relationships, life and this complex human condition (their different outlooks, rationality and emotions resulting in heavy conversations). Besides reminiscing and reflecting on how they met, how their lives have changed from being young and care-free to being adults and parents, the heavy issues cannot be avoiding and have to come to a head. Hawke and Delpy are so invested in these characters that they co-wrote it with Linklater. This is a fascinating passage in the lives of people going from optimistic youth to responsible parents, its joys and frivolity reflected, and mortality of both relationships and life coming to the surface (something anyone who has been in a relationship of any kind can identify with). Always a part of these movies is the inanimate character of the locations' romantic glimpses of the various European (and here Mediterranean) regions. PS. Linklater's extended experimental movie-making and growing-up exploration has gone beyond this two-decade trilogy to his new movie Boyhood (2014, also with Hawke), shot across 12 years, using the same actors along the passage of a boy growing up.